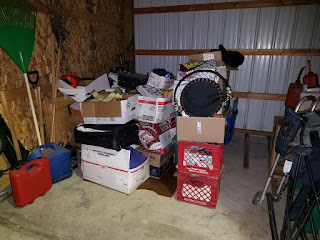 JEFF BEEMAN ONLINE : We Bought This Small Storage Unit To Re Sell on eBay! Many might think storage units are also a outside activity and not real popular during this season...and for some that would be correct. The outside auctions have now turned more toward online auctions but you still have to be in the weather to get the unit cleaned out and store it somewhere! Around the larger city areas you will also still find several "live" auctions to attend as well. They move fast due too the cold so if you go be ready! Always a popular question when buying storage units ..."Just exactly what do you need to be ready when the moment strikes??" 1) A lock to secure the unit you purchase. 2) A broom to sweep it out. 3) Trash bags or even a trash can to help sort. 4) CASH! Most auctions will only accept cash and you need enough to cover cleaning deposits. 5) A truck and or trailer is best - Many storage units may have rentals like Uhaul so it's possible to use that to move your treasurers but it does cost extra. 6) Might consider a 2 wheel dolly for the big stuff and a partner to help load. 7) And maybe the most important - A Plan! Know what you can or can not spend. 8) Learn how to profile a unit so you can make the most of your investment. Profiling is simply looking at the storage unit and determining if it is a decent investment. If you are looking at a Unit that is full of trash bags and scattered loose items then it is what it appears to be...trash. Storage units that look tossed and you can see foot prints or hand prints in the dust, have actually been "tossed" or gone through, ether by the original owner or even the storage facility staff. We also must look for the obvious "Click Bait" - Has somebody (normally the facility owners trying to drive up the bidding) "staged" nice items in the front where you just can't miss it? So YES! There is a lot to learn including what to look for but storage units, in my honest opinion, give you the biggest bang for your sourcing buck. Once you start buying successful units and can sell more than 30% of what you find you will make good money - on average only 10% of a unit is actually re-sell-able. Here is our latest video from the storage unit we purchased the first week of December 2018! So what moved us to bid on and buy this abandoned storage unit for $170.00? Well, the first thing we saw was the red tool box, I then saw a tow strap and jumper cables in the back. The old tennis racket, Steelers blanket and foot ball also caught my eye. What we have here is a "Guys Unit" .... My hopes were to find more collectible sporting goods and tools as we dug into it. What did we actually find besides the obvious? Some of it is revealed in this video but tune into my YouTube channel jeffbeeman247.com for some un-boxing video's here in the next week or two. Until then we wish you a Merry Christmas and A Happy and Prosperous reselling year in 2019!